The Piper Warrior is a four seat light aircraft known the world over for it’s easy handling capabilities. Due to their build quality and reliability they are the preferred choice for a great many flying clubs. A trial lesson voucher entitles one person to the flight and we try to accommodate a passenger in the back of the plane if requ ired. There is no extra charge for this but there maybe weight constraints. 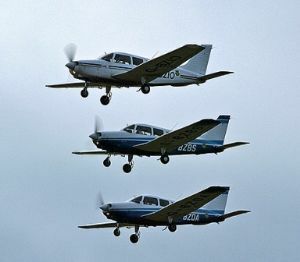 The Piper Warrior is used by West London Aero Club for flying lessons to train pilots for their PPL or NPPL and a trial lesson counts towards the training required to gain either of these licences. All lessons begin with a briefing with your flying Instructor who will explain the principles of flight and how the aircraft works. You will get the opportunity to fly the plane yourself and experience the feeling of piloting a light aircraft. During the lesson the instructor will explain and demonstrate various manoeuvres giving you the chance to have a go at climbing, descending, straight and level flight and turning left and right. At the end of the lesson you will receive a Certificate of Achievement and be able to chat to your Instructor should you want any advice about taking your flying ambitions forward. This gift voucher/flying experience includes the ‘Introductory Flying Lesson book’. If you have purchased this as a gift for someone please ensure that you enter the name of the person who will be flying in the box on the checkout page. The book has been specifically written to help get the most from your flying experience. The voucher and book are sent with a West London Aero Club logo on the envelope. If you want your gift to be a surprise and would like the logo removed, please let us know in the notes. For more information contact Operations on 01628 823272 or select your option below and click the Buy Now button to purchase on-line.